(Reuters) – Protests by supporters of ousted Islamist President Mohamed Mursi turned violent across Egypt on Friday, with witnesses reporting four dead in central Cairo and at least 12 killed in northern cities as the Muslim Brotherhood staged a “Day of Rage”. The army deployed dozens of armored vehicles on major roads around the capital after Mursi’s Brotherhood movement called the demonstrations, and the Interior Ministry said police would use live ammunition against anyone threatening public buildings. The violence followed Wednesday’s assault by security forces on two Brotherhood sit-ins in Cairo that left hundreds dead, as security forces tried to end weeks of turbulence following the army’s toppling of Mursi on July 3. In Cairo gunshots echoed around the huge Ramses Square, focal point of Brotherhood protests in the capital, and police fired salvoes of tear gas. Four people were killed and many more wounded by gunshot and birdshot in the square, a witness said. Nile TV showed footage of one gunman among Islamist protesters firing from a city center bridge. Injured men, one with a bloody wound in the middle of his chest, were rushed away on the back of a pick-up truck. Emergency services also said eight protesters were killed in clashes in the Mediterranean town of Damietta, and four people died in the northeastern city of Ismailia. Violence was also reported in Egypt’s second city Alexandria and in the Nile Delta city of Tanta. A police conscript was killed in a drive-by shooting in the north of the capital, state news agency MENA reported. Deeply polarized after months of political turmoil, Egypt stands close to the abyss of chaos with Islamist supporters refusing to accept the toppling of Mursi, which followed mammoth rallies castigating his trouble-plagued, year-long rule. “It’s not about the Brotherhood, it’s about human rights,” said Ahmed, one of the few women not wearing a headscarf, a sign of piety for Muslim women. As the sound of teargas canisters being fired began, protesters – including young and old, men and women – donned surgical masks, gas masks and wrapped bandannas around their faces. Some rubbed Pepsi on their faces to counter the gas. “Allahu akbar! (God is Greatest)” the crowd chanted. Signaling his displeasure at the worst bloodshed in Egypt for generations, U.S. President Barack Obama said on Thursday normal cooperation with Cairo could not continue and announced the cancellation of military exercises with Egypt next month. “We deplore violence against civilians. We support universal rights essential to human dignity, including the right to peaceful protest,” he said, but stopped short of cutting off the $1.55 billion a year of mostly military U.S. aid to Egypt. The Brotherhood accuses the military of staging a coup when it ousted Mursi. Liberal and youth activists who backed the military saw the move as a positive response to public demands. But some fear Egypt is turning back into the kind of police state that kept the disgraced Hosni Mubarak in power for 30 years before his removal in 2011, as security institutions recover their confidence and reassert control. Friday prayers have proved a fertile time for protests during more than two years of unrest across the Arab world. 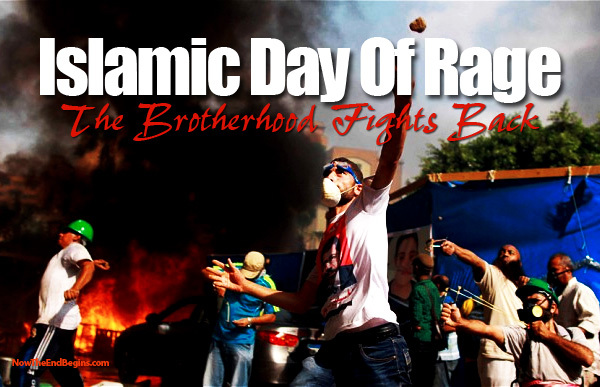 In calling for a “Day of Rage,” the Brotherhood used the same name as that given to the most violent day of the uprising against Mubarak. That day, January 28, 2011, marked the protesters’ victory over the police, who were forced to retreat. Ironically, the epicenter of the anti-Mubarak protests, Tahrir Square, was deserted on Friday, sealed off by the army. Underscoring the deep divisions in the most populous Arab state, local residents helped the army block access to Cairo’s Rabaa al-Adawiya mosque, the site of the main Brotherhood sit-in that was swept away during Wednesday’s police assault. “We are here to prevent those filthy bastards from coming back,” said Mohamed Ali, a 22-year-old business student. The Egyptian presidency issued a statement criticizing Obama, saying his comments were not based on “facts” and would strengthen violent groups that were committing “terrorist acts”. Pro-army groups posted videos on the Internet of policemen they said had been tortured and killed by Islamist militants. Washington’s influence over Cairo has been called into question since Mursi’s overthrow. Since then Saudi Arabia, Kuwait and the United Arab Emirates have pledged $12 billion in assistance, making them more prominent partners. Obama’s refusal so far to cut off U.S. aid to Egypt suggests he does not wish to alienate the generals despite the scale of the bloodshed in the army’s suppression of Mursi supporters. Egypt will need all the financial support it can get in the coming months as it grapples with growing economic woes, especially in the important tourism sector that accounts for more than 10 percent of gross domestic product. The United States urged its citizens to leave Egypt on Thursday and two of Europe’s biggest tour operators, Germany’s TUI and Thomas Cook Germany, said they were cancelling all trips to the country until September 15.